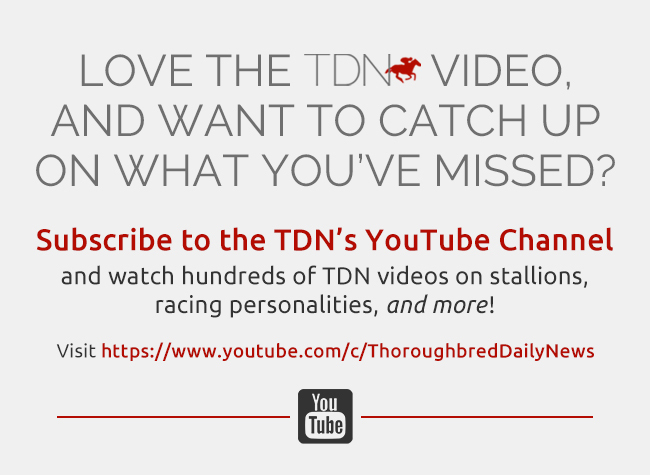 The Fasig-Tipton New York-bred Preferred Yearlings Sale, following just days after an impressive renewal of the company’s Select sale, got off to a strong start at the Humphrey S. Finney Pavilion in Saratoga Saturday night. 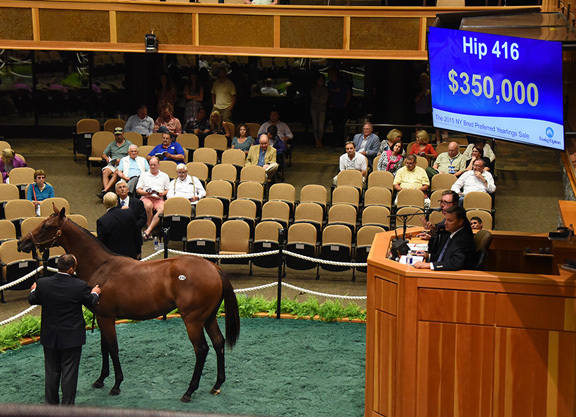 A total of 88 yearlings grossed $7,126,500 during the session, compared to 92 yearlings selling for $6,934,000 during last year’s opening session. The average of $80,983 was up 7.4% from 2014, while the median dipped 15% to $51,000. With 128 yearlings offered, 40 were reported not sold for a buy-back rate of 31%. It was 36.1% last year. The top price at last year’s auction–$270,000–was bettered three times during Saturday’s session, with Vivien Malloy and Lady Sheila Stable teaming up to buy a filly by Tiznow (hip 416) for top price of $350,000. In all, eight yearlings sold for $200,000 or more during the session, equaling the two-day total of a year ago. Sunday’s final session of the two-day auction gets underway at 7 p.m.
New York stalwart Vivien Malloy teamed up with Sheila Rosenblum’s Lady Sheila Stable to take home the top lot at Saturday’s opening session of the Fasig-Tipton New York-bred Preferred Yearlings sale, going to $350,000 for a daughter of Tiznow. Out of Grade I winner Acey Deucey (Abaginone), hip 416 is a half-sister to multiple stakes winner Preachintothedevil (Pulpit). Consigned by Summerfield, the yearling was bred by Stone Bridge Farm. Linda Rice will train the yearling. Malloy, who owns Edition Farm in Hyde Park, NY, admitted she was already looking ahead to the yearling joining her broodmare band down the line. “We were pricing empty, not even bred, and she would be worth a lot,” Malloy said. Malloy acknowledged competition for New York-breds has gotten fierce, but she hopes to take advantage of that during Sunday’s second session of the auction. Maggie Seidman, sitting alongside bloodstock agent Mike McMahon, went to $300,000 to secure a filly from the first crop of multiple Grade I winner To Honor and Serve (Bernardini) during Saturday’s opening session of the Fasig-Tipton New York-bred sale. Hip 380, consigned by David Reid’s Preferred Equine, is out of stakes winner Tale of a Dream (Tale of the Cat) and is a half to stakes-placed Dynamic Barbie (Roman Ruler). She was purchased for $47,000 at this year’s Keeneland January sale. McMahon admitted the bay filly’s young sire was a major attraction. Seidman, who has horses with trainer Carlos Martin, campaigned stakes-placed J J Julep. The sale of the To Honor and Serve filly marked the biggest Thoroughbred success for David Reid’s Preferred Equine. Reid, a leading standardbred consignor for the better part of three decades, was making his third appearance at the Fasig-Tipton New York-bred sale Saturday. Reid, who is a partner in Ice Wine Stable which campaigned Group 1 winner No Nay Never, sold two yearlings at the 2013 New York sale and brought four yearlings to the 2014 sale. “This is our biggest sale result in Thoroughbreds,” he confirmed. 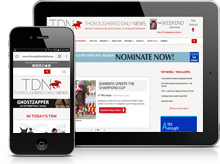 “We are growing slowly, but I have to give a shout-out to Fasig-Tipton and their team. They do a great job and, being in the sales business for 30 years myself, I really appreciate the job they do–it’s first class all the way. A colt by Flatter kicked off early fireworks during Saturday’s Fasig-Tipton New York sale when bringing a final bid of $290,000. Seth Klarman of Klaravich Stables signed the ticket on the dark bay yearling as LRK Stable, but declined to comment on the purchase. Hip 333, consigned by Winter Quarter Farm on behalf of breeder Oak Bluff Stables, is out of stakes winner River Nore (Archers Bay). Winter Quarter had success with another son of Flatter Saturday night when LRK Stable purchased hip 345 for $150,000. Bred by Waterville Lake Stables, the dark bay is out of stakes-placed Santa Croce (Saint Ballado). Bloodstock agent Mike Ryan purchased hip 351, a daughter of Lookin at Lucky, for $255,000 Saturday at Fasig-Tipton. Ryan was bidding on behalf of a new client, who asked not to be identified. Bred by Dennis and Deborah Petrisak, the yearling is out of multiple stakes winner Shesastonecoldfox (Foxhound) and is a half to multiple stakes winner Fox Rules (Roman Ruler) and to stakes winner Fox Rox (Officer). She was consigned by Thomas J. Gallo III Sales Agency. Centennial Farms, which campaigns Grade I winner Wicked Strong (Hard Spun), acquired another son of the same stallion when going to $200,000 for hip 338. Consigned by Bluewater Sales, the yearling is out of Ruly (A.P. Indy), a half-sister to multiple Grade I winner Questing (GB) (Hard Spun). Little, who said he got shut out of the Saratoga Select sale earlier in the week, was making his first shopping foray at the New York sale. Mike McMahon had a busy night during Saturday’s session of the Fasig-Tipton New York-bred sale, facilitating in the purchase of the evening’s top two lots. A little more under the radar, McMahon enjoyed an impressive pinhooking score when hip 362, a son of Here Comes Ben, sold for $175,000 to Midwest Thoroughbreds. McMahon had purchased the youngster for $20,000 at last fall’s Fasig-Tipton Saratoga Mixed Sale. A few hips before the Here Comes Ben colt, McMahon sold a homebred son of Artie Schiller (hip 348) for $170,000 to Niall Brennan under his McMahon of Saratoga Thoroughbreds banner.